The revival of nationalism in western Europe, which began in the 1990s, has been associated with increasing support for radical right parties. This column uses trade and election data to show that the radical right gets its biggest electoral boost in regions most exposed to Chinese exports. Within these regions communities vote homogenously, whether individuals work in affected industries or not. There has been a revival of nationalism in western democracies. The outcome of the Brexit referendum and the election of Donald Trump as president of the US are two major manifestations of this tendency. 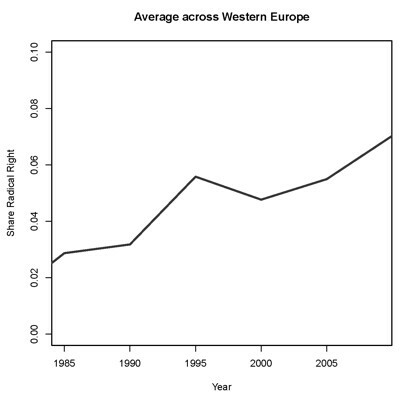 In Europe this trend began in the 1990s, and it has been associated with increasing support for radical right parties (Mudde 2007). In recent paper, we show that globalisation is a key determinant of this phenomenon (Colantone and Stanig 2017). We focus on the competitive shock created by the surge in imports from China between 1988 and 2007. This shock has had a heterogeneous impact across European regions that depends on the historical composition of employment in the region. Using data on legislative elections in 15 western European countries, we find that stronger regional exposure to the import shock determines an increase in support for nationalist parties, a general shift to the right in the electorate, and an increase in support for radical right parties. The policy proposals of these parties tend to bundle support for domestic free market policies with a strong protectionist stance, a combination that has come to be referred to as ‘economic nationalism’. As parties offering this policy mix become increasingly successful, we might see the end – and possibly even a reversal – of globalisation. We built a region-specific indicator for the exposure to Chinese imports following the methodology introduced by Autor et al. (2013). This combined information on yearly national imports from China, by industry, with data on the historical composition of employment in each region. The exposure of regions to the growth in Chinese imports depends on their ex ante industry specialisation. Intuitively, larger import shocks would happen in regions which have a larger share of their workers in the manufacturing sector. Given the same share of manufacturing workers, the variation in exposure to Chinese imports between regions would depend on differences in the specialisation of each region’s manufacturing industry. The shock would be stronger in regions where relatively more workers were initially employed in those industries in which growth in imports from China was strongest (for example, textiles or electronic goods), and in years when the surge in Chinese imports in those industries was largest. We performed the analysis at the NUTS-2 level of regional disaggregation. In total, our sample included 198 regions across 15 countries.1 Depending on the country, we sourced employment data either from Eurostat or from national sources. Trade data come from Eurostat Comext or from CEPII-BACI. The industry level of disaggregation is the NACE Rev. 1.1 subsection level. Figure 1 displays the variation in the import shock across regions, based on average regional figures; darker shades indicate stronger exposure. We assembled election data at the district level for 76 general elections between 1988 and 2007. Data comes from the Constituency-Level Election Archive (CLEA, Kollman et al. 2016), the Global Election Database (GED, Brancati 2016), and national sources. For each district, in each election, we had information on vote shares at the party level. We linked election results with ideology scores for each party so that we could assess the ideological leaning of a district in an election. To do this we used data from the Comparative Manifesto Project (CMP), which attributes policy positions by using content analysis of party election manifestos. Following the established methodology used by Laver and Budge (1992) and Lowe et al. (2011), we computed two scores for each party in each election: a ‘nationalism’ score, and a ‘right-wing positioning’ score. We then combined these ideology scores with party vote shares to compute several district-level summaries for each election. The combined vote share of parties above the national median position on that dimension. Finally, we also computed one district-level summary to address directly the connection between globalisation and radical right success. This was the vote share of radical right parties. We identified these parties using earlier research.2 Figure 2 shows the growth in the vote share for these parties over the sample; each point in the figure is a 3-year moving average. An increase in support for radical right parties. Our research predicts that a region at the 75th percentile of the import shock would display support for radical right parties by 0.7 percentage points more than a region at the 25th percentile, ceteris paribus. Considering that the average vote share for radical right parties is 5%, with a standard deviation of 7%, this result is not negligible. Our results contribute to an emerging body of research on the electoral consequences of globalisation. For the US, others have already investigated the effects of trade exposure on polarisation, turnout, and the anti-incumbent vote (Autor et al. 2016, Che et al. 2016, Margalit, 2011, Jensen et al. 2015). In France, Malgouyres (2014) investigated the effect on radical right support, and Dippel et al. (2016) did the same for Germany. In our previous work, we have also adopted a similar identification strategy to show a positive effect of the Chinese import shock on support for the ‘Leave’ option in the Brexit referendum (Colantone and Stanig, 2016a and 2016b). 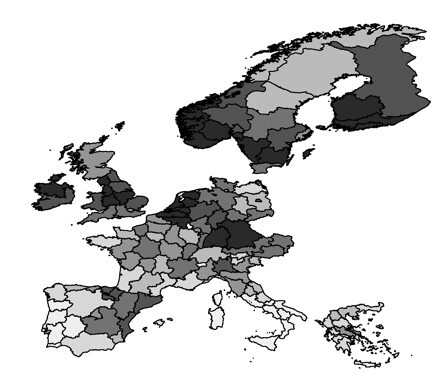 We found additional evidence by using individual-level data from the European Social Survey. Accounting for basic demographic characteristics and election fixed effects, a stronger import shock in the region of residence pushed voters towards more nationalist and conservative policy positions, and increased the probability of support for radical right parties, in line with our district-level evidence. We also investigated, through interaction terms, how the effects of import competition varied across different categories of voters, based on their employment status and occupation. These effects were largely stable across the groups, even when considering service workers and public sector workers, whose jobs were not directly affected by manufacturing imports from China. Our evidence suggests that the impact of import competition was not confined to groups, such as the unemployed or manufacturing workers, which might have been more directly affected by Chinese imports. On the contrary, as globalisation threatens the success and survival of entire industrial districts, the affected communities seem to have voted in a homogeneous way, regardless of each voter’s personal situation. Globalisation has caused a surge in support for nationalist and radical right political platforms. This might endanger the survival of the open world of the past 30 years. President Trump’s withdrawal from the Trans-Pacific Partnership seems to be a move in that direction. Yet, a return to protectionism is not likely to solve the problems of those who have lost ground due to globalisation without appropriate compensation of its ‘losers’, and is bound to harm growth especially in emerging economies. The world rather needs a more inclusive model of globalisation. Autor, D H, D Dorn and G H Hanson (2013), “The China Syndrome: Local Labor Market Effects of Import Competition in the United States”, American Economic Review, 103: 2121-2168. Autor, D H, D Dorn, G H Hanson and K Majlesi (2016), “Importing Political Polarization? The Electoral Consequences of Rising Trade Exposure”, Mimeo, MIT. Bloom, N, M Draca and J Van Reenen (2016), “Trade-Induced Technical Change: The Impact of Chinese Imports on Innovation, IT and Productivity”, Review of Economic Studies, 83: 87-117. Brancati, D (2016), “Global Elections Database” [computer file]. New York: Global Elections Database [distributor]. Che, Y, Y Lu, J R Pierce, P K Schott and Z Tao (2016), “Does Trade Liberalization with China Influence U.S. Elections?,” Mimeo, Yale School of Management. Colantone, I, R Crinò and L Ogliari (2015) “The hidden cost of globalization: Import competition and mental distress”, CEPR, Discussion Paper 10874. Colantone, I and P Stanig (2016a), “Globalisation and Brexit”, VoxEU, 23rd November. Colantone, I and P Stanig (2016b), “Global Competition and Brexit”, BAFFI CAREFIN Centre Research Paper 2016-44, November. Colantone, I and P Stanig (2017), “The Trade Origins of Economic Nationalism: Import Competition and Voting Behavior in Western Europe”, BAFFI CAREFIN Centre Research Paper 2017-49, January. Dippel, C, R Gold and S Heblich (2015), “Globalization and Its (Dis-)Content: Trade Shocks and Voting Behavior,” NBER Working Paper 21812. Jensen, B J, D P Quinn and S Weymouth (2016), “Winners and Losers in International Trade: The Effects on US Presidential Voting,” NBER Working Paper 21899. Kollman, K, A Hicken, D Caramani, D Backer and D Lublin (2016), “Constituency-Level Elections Archive” [data file and codebook]. Ann Arbor, MI: Center for Political Studies, University of Michigan [producer and distributor]. Laver, M and I Budge (1992), Party Policy and Government Coalitions, New York: St. Martin's Press. Lowe, W, K Benoit, S Mikhaylov and M Laver (2011), “Scaling Policy Preferences from Coded Political Texts,” Legislative Studies Quarterly 36: 123-155. Malgouyres, C (2014), “The Impact of Exposure to Low-Wage Country Competition on Votes for the Far-Right: Evidence from French Presidential Elections,” Mimeo, European University Institute. Margalit, Y (2011), “Costly Jobs: Trade-Related Layoffs, Government Compensation, and Voting in US Elections,” American Political Science Review 105: 166-188. Mudde, C (2007), Populist Radical Right Parties in Europe, New York: Cambridge University Press. The countries in our sample were: Austria, Belgium, Finland, France, Germany, Greece, Ireland, Italy, Netherlands, Norway, Portugal, Spain, Sweden, Switzerland, United Kingdom. NUTS-2 regions have population between 800,000 and 3 million. For Germany, the required data is available only at the more aggregated NUTS-1 level. Hence 16 out of 198 regions in our sample correspond to NUTS-1 regions. The list includes: SMP Finnish Rural Party, PS True Finns, VB Flemish Bloc, LPF List Pim Fortuyn, PVV Party of Freedom, VB Flemish Interest, FN National Front, LN Northern League, LAOS Popular Orthodox Rally, FPO Austrian Freedom Party, Freedom Movement, NA/AN National Action for People and Fatherland, SD/DS Swiss Democrats, SVP/UDC Swiss People Party, Swiss Motorists Party, FPS Freedom Party of Switzerland, UKIP United Kingdom Independence Party.